Here the introductionvideo. You have the choice between a version that is encoded with XVid and a WMV version, which should play at every Windows system. The content is the same in both versions. Some small repairs. Mainly at the Planting module. I have finally found the cause for the stairs effect. This bug has kept me busy since a pretty while. Was not this easy to catch this rascal. Instead working with floats MMF decided to work with integers at one place. Resulted in this stairs effect. Now the plants should really fit to the ground, and not longer float in the air by this stairy way. Further fixes:heightratio goes now from 1 to 25. OBj export module shows the Output width from the beginning on. And changings in the height ratio gets stored there now too. HemaHema should be fully Vista compatible now. I have changed paths over paths to avoid conflicts with the user rights. Everything that somehow saves is moved to the Appdata directory. 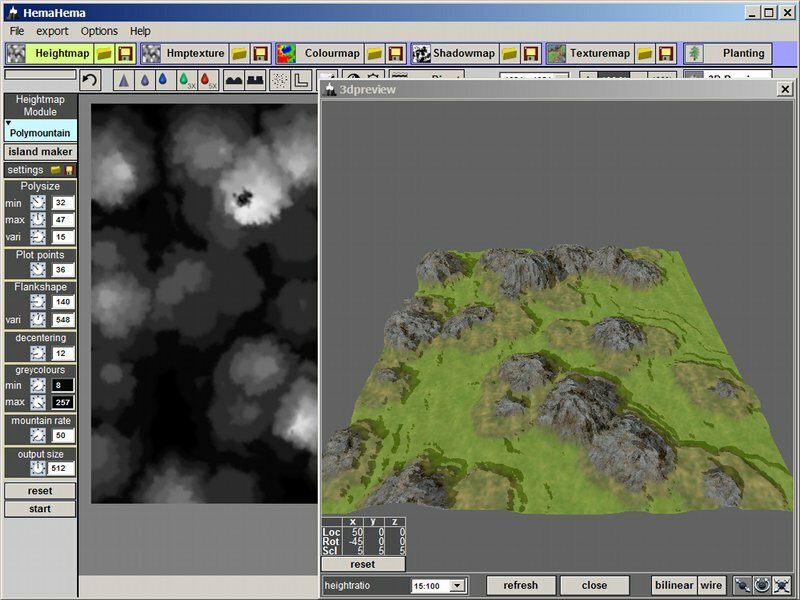 Ini, temp datas, stored datas and the settings for the heightmap modules. Damn rightshassle. Thanks Microsoft. Further changings are a way to save and load settings for the heightmap modules. And i fixed two more small bugs. I hope that the Vista fix hasn’t brought up new bugs. And declare this version to the final version.